The following is a set of scripts packaged as an app. It is designed to automate the AFNI installation steps. You should launch the script by double clicking the icon like a regular program. 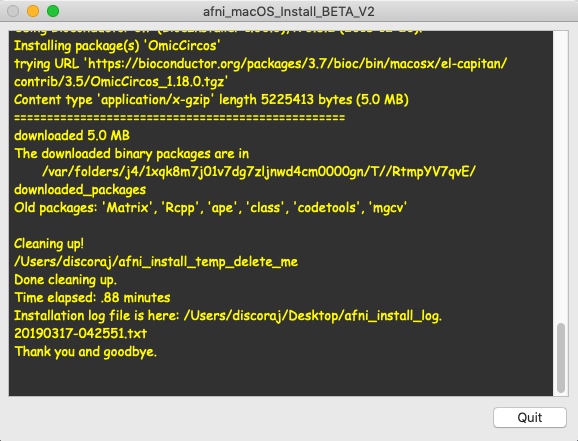 It can also run the afni_system_check, download class / bootcamp data, and install shiny packages. 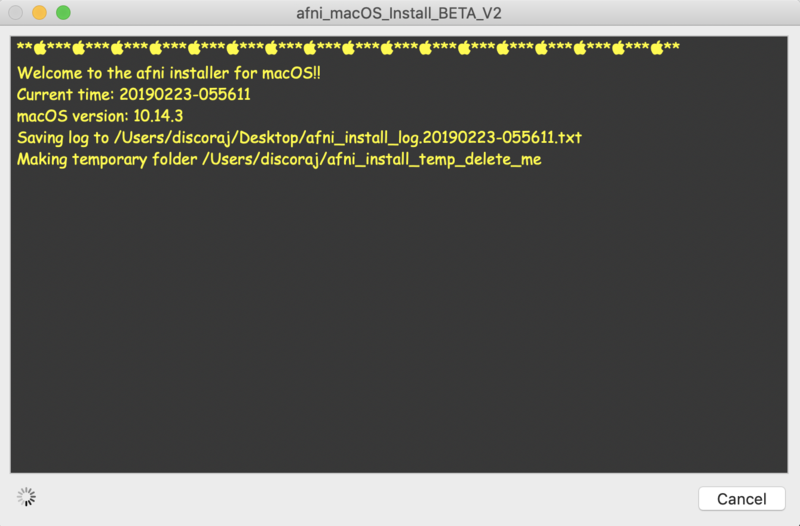 If a package is already installed, you may be asked if you want to reinstall it. But you can skip it if you like. This script will also setup your ~/.cshrc, ~/.bashrc, and ~/.bash_profile. It will add the appropriate entries to your paths specified there. After completion, you should restart your computer just in case. This is a BETA script, so your feedback is welcome. We have tested the app on 10.10 to 10.14 with various hardware. If you are seeking the non-App version of install instructions, please see HERE. This script will has been tested on various systems from to macOS 10.11 to 10.14. It should work down to 10.7, but it has not been tested. Download the file and extract the zip if it did not extract automatically in your Downloads folder. Right or control clicking the app icon. Then click Open from the popup menu. Now you will be able to open it. You may also get warnings for “System Events” or “Finder” access. 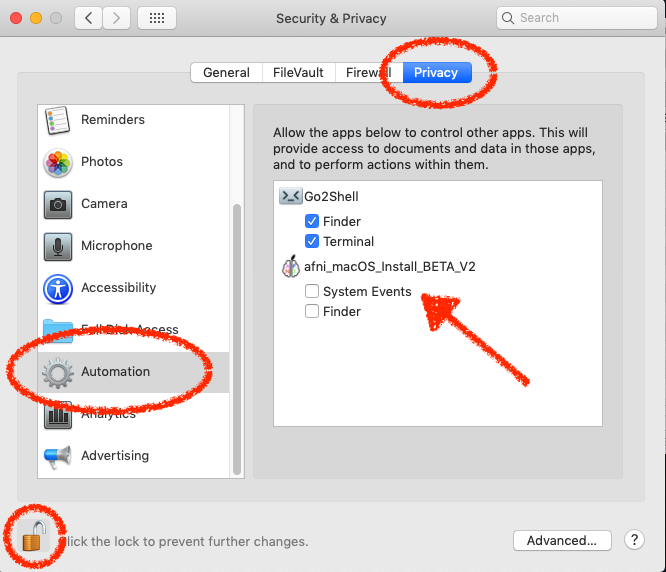 These will grant access for the app to use apple script and automator for opening dialogs and using the Finder to choose folders. 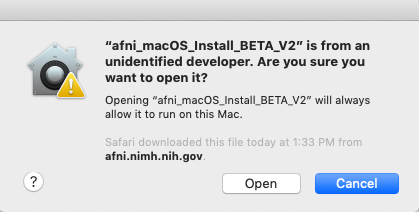 Click the lock to make changes and check the box(es) under the “afni_macOS_install_BETA_V2” entry. This is NOT an unattended install! The dialogs WILL time out after ~10 hours. The next dialog presents you with choices of what to install. For some packages, you may need to enter your password in the dialog box. 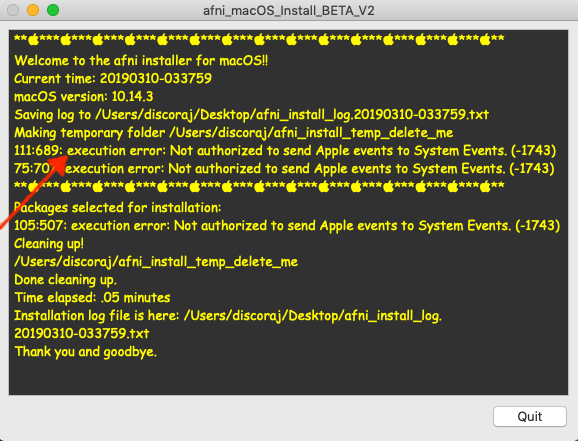 Notice that a temporary folder “afni_install_temp_delete_me” is created in your home directory. It will be deleted when you quit. If not, it is safe to delete. Here are a few details of the choices that presented for installation. The command line tools are mostly necessary for compiling some R packages from source (gcc etc.). But that mostly happens behind the scenes so you won’t have to deal directly with any of that. This is desktop manager needed to run X11 programs, such as afni. During the install you may notice the xquartz installer drive briefly mount and unmount. No. Not beer, but a package manager for macOS. It is used to install netpbm which has functionality for converting image formats (such as to PNG) and is used in several programs like @snapshot_volreg, @chauffeur_afni and others. Also installs openmpi for multiprocessor support in R.
This is what is usual the catch phrase of pirates on the high seas. But here we are talking about the free software environment for statistical computing and graphics. afni needs this for several of the group analysis programs. The version installed with this app is version 3.5.2 (Eggshell Igloo) released on 2018-12-20. The CRAN mirror is https://cloud.r-project.org so it should automatically choose a mirror close to your geographical location. See R project main page. A few thing are happening here. Basically running @update.afni.binaries. It will default to installing in ~/abin, but you can choose your own favorite folder. Updates your ~/.cshrc, ~/.bashrc, ~/.bash_profile, and other environments. 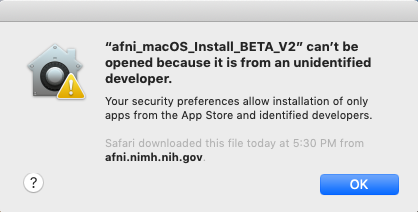 If you selected afni_system_check (which you should do…), you will be presented with a dialog to let you view it before you procede. 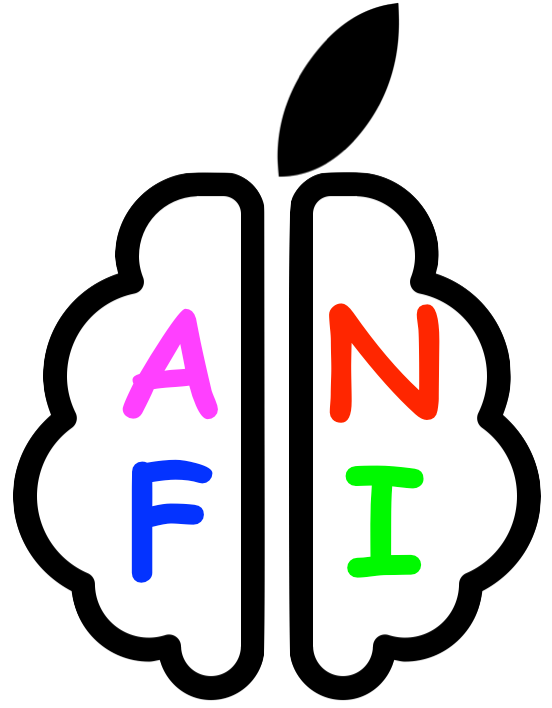 The afni_system_check output will have been saved to your desktop. It is named something obvious like “afni_system_check.20190208-145815.txt”. Clicking “View” will open the file in your default text editor. This file may be useful for figuring out problems with the install, especially when posting to the message board. Download class data and prep it for bootcamps or your own practice. 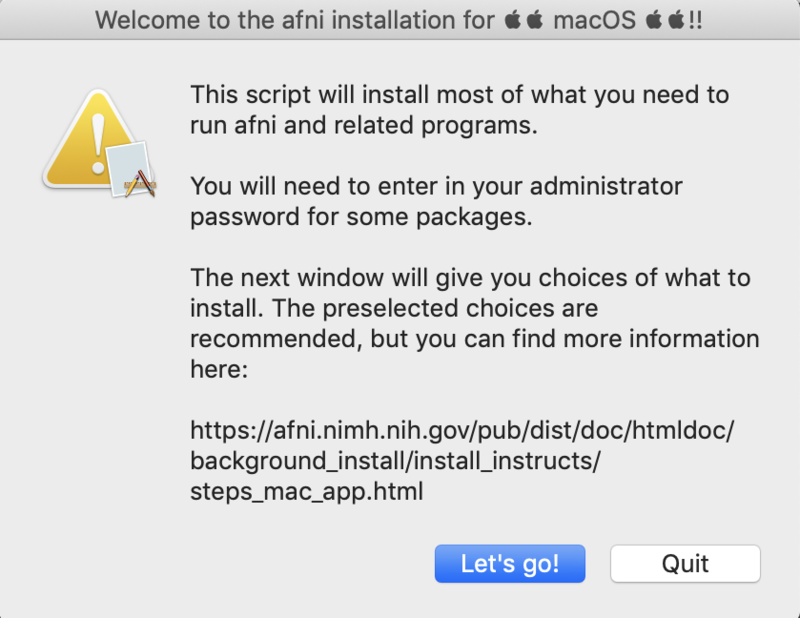 Install optional packages for some of afni’s shiny integrations. You can learn more about shiny apps here. Upon completion of all installations, and barring any error, you should see a completion dialog. Then you can review the text or quit the app. This is a BETA script, so your feedback is welcome. We have tested the app on 10.10 to 10.13 with various hardware. Download the file and open it to extract the contents. 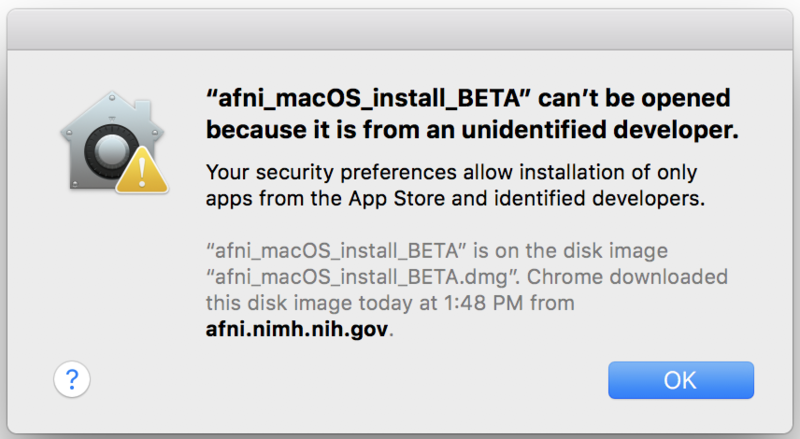 Double click the “afni_macOS_install_10.7_BETA” or “afni_macOS_install_10.12_BETA” icon. You may get a popup notification about an “unidentified developer”. Right click or control click the app icon. Then click open from the shortcut menu. This will launch your terminal. Most of the rest of the interactions are in the terminal. 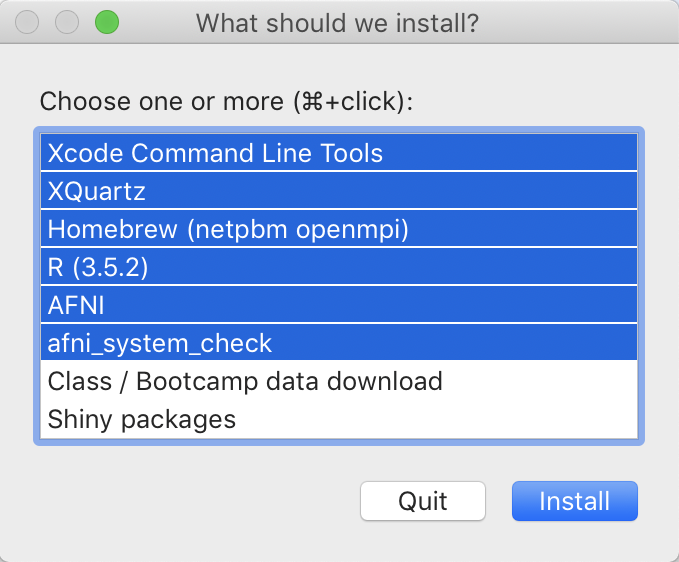 If needed, the Xcode command line tools will popup an installation window. Once complete, return to the terminal to continue. To accept the default options (shown in [ ]), just press Enter. For some sections, you may need to type in your password. 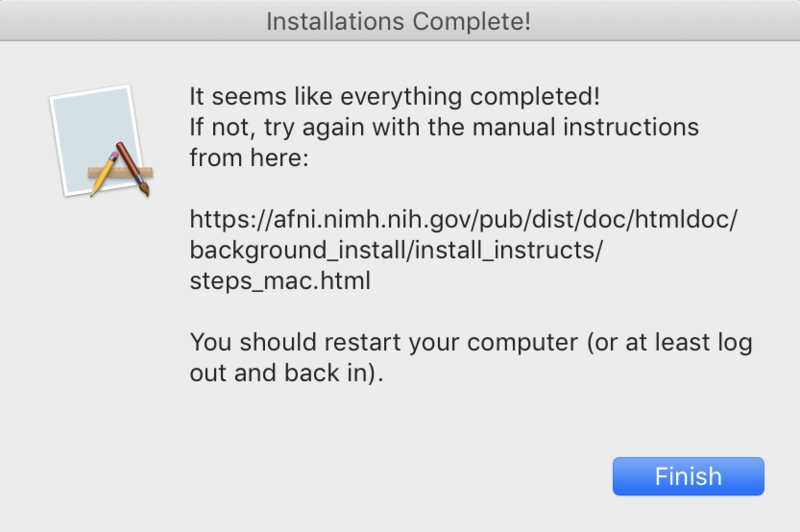 If you are not an administrator on your computer, this installation may fail. Make sure you have permissions for the folder you choose for AFNI! The sudo prompt will time out after awhile, so this is not an unattended install. This script does not install fink. Nor does it download the class data. The icon is a work in progress. If you have some design skills, please send me alternatives.